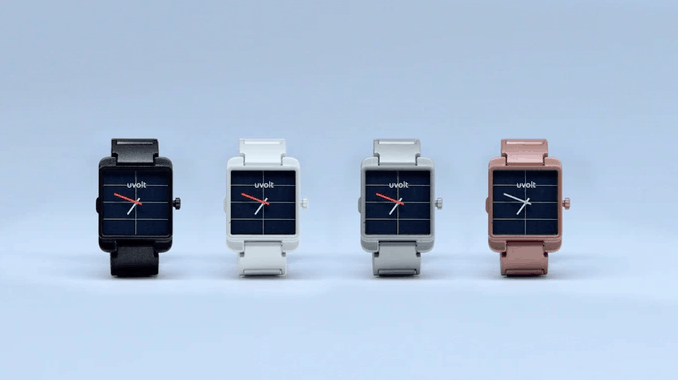 The Uvolt Solar Watch is the most recent wearables to hit the market. Unlike most other wearables its purpose is not to track your steps, show your notifications, or respond to messages. Instead, the sole purpose of this watch is to act as a portable charger. It uses the sun’s energy to passively charge its internal battery that can then be used to charge your phone battery. This unique product is changing the way we think of wearable technology and has thus created a lot of buzz. In fact, Uvolt’s crowd funding campaign on Kickstarter has already surpassed their $100,000 goal. They still have a few weeks left until they close their campaign and begin to start the production of the product. In its most basic form the Uvolt is a watch. It uses small analog hands to display the time without the use of actual numbers. This classic analog design appeals to many and gives the watch a good cosmetic look. In addition the analog hands are built with minimal width to maximize the performance of the solar panel. Underneath the analog hands is where this watch gets interesting. It uses a high quality 37 x 37 mm solar panel to charge its internal battery. This solar panel is extremely efficient and has an energy conversion rate of 21%. 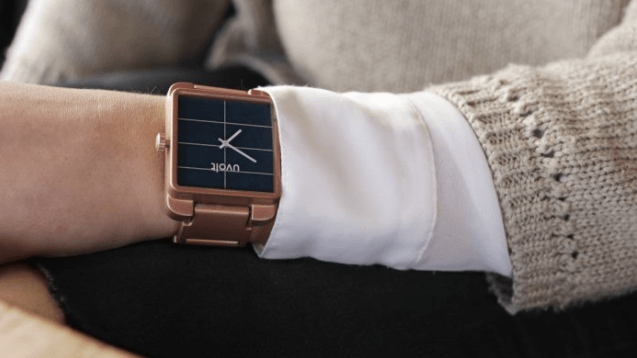 This high-efficiency panel allows the watch to charge its internal battery in a relatively short amount of time (about 1 full day of charging by solar). To aid the solar panel the watch is also covered with a thin sheet of anti-reflective mineral glass. This allows the panel to get the most amount of sunlight within its small surface area. If the solar panel isn’t sufficient enough the watch also comes with a wireless charging pad. This inductive charging avenue allows you to charge the small battery pack in around 45 minutes. Since this is the faster charging avenue it is recommended to use the charging pad as your main charging source while you use the solar panel to simply top off the watch. A small 600 mAh internal battery is used to store the energy from the charging pad and solar panel. This power reserve combines a custom circuit that handles the electrical flow of the watch with a high-density lithium-ion battery. The power reserve also comes with three charging avenues. There is an integrated lighting port for Apple devices, Mirco USB/USB-C ports for Android devices, and wireless charging. 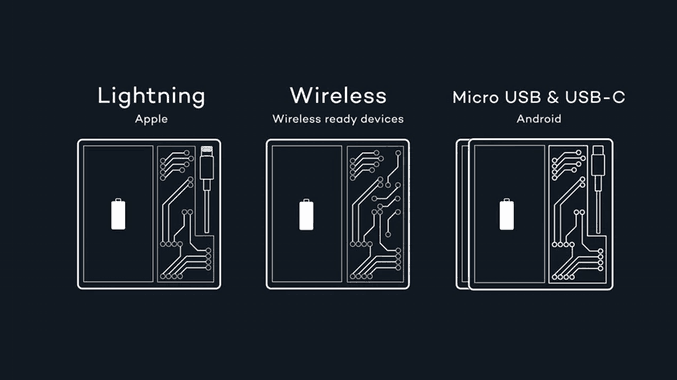 As we mentioned above each one of these power reserves has a capacity of 600 mAh to charge your mobile phone. While this isn’t enough to completely charge a phone, it’s still enough to give you 5 hours of talk time, 3 hours of internet browsing, and 3 hours of video streaming. On top that, Uvolt filled the bracelet with batteries to add more capacity. This extra capacity charges the depleted power reserve and gives you a second charge. In total the power reserve and bracelet give you a maximum of 1,000 mAh to charge with. Once again this won’t charge most phones completely, but is enough to top off your phone battery through out the day. In the end the Uvolt solar watch is a unique and interesting product. 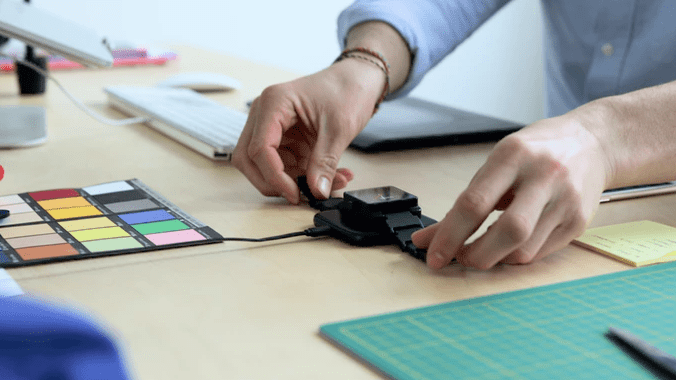 It takes the usual wearable technology and puts a little twist on it. While it isn’t as powerful as most other solar chargers or solar battery packs, it’s definitely a cool idea and a solution to a common problem. It should be noted that Uvolt is a new company and has never shipped a product before. The first versions of this product might not be as great as some people boast it to be. But thats how most new products are and they adapt over time. If there are two things we could change about the product it would be a larger battery capacity and a more sleek design. We personally think the watch is too big compared to other wearables on the market and the battery capacity is simply not big enough. With that being said we definitely think you should check out this product. 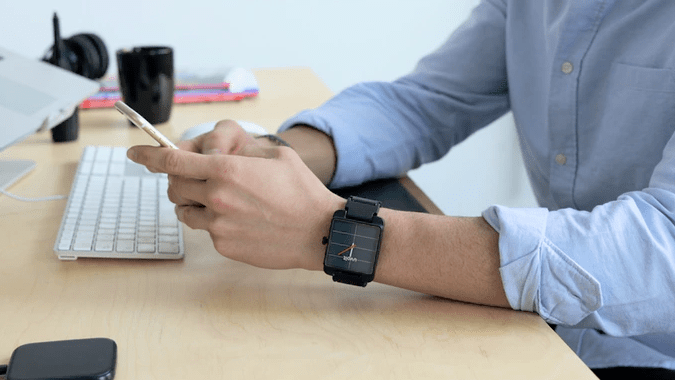 You can currently back this watch on Kickstarter with prices starting as low as $99. So if you simply like cool tech or need a portable charger then we recommend learning more.